Os Cavaleiros dos Nove é um complemento oficial para Oblivion, que se centra da ordem homónima enquanto eles recuperam as relíquias perdidas do Cruzado Divino. Uma lista de perguntas mais frequentes é disponível na página de FAQs. Creatures — Two entirely unique types of creatures are introduced with the add-on, while two others are new variations of existing creatures. Items — Items introduced with the add-on include new armor, books, jewelry and weapons. Magic — Eight blessings, four curses and five powers are included with the add-on. 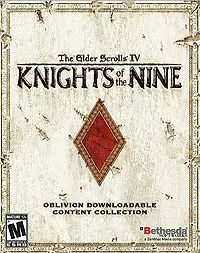 NPCs — Over 30 new NPCs are introduced with the add-on, many of which are aligned with The Knights of the Nine faction. Places — 8 new locations are included with the add-on, while a number of existing locations are altered once the add-on has been installed. Quests — 11 quests are added to the game by the add-on, all following a main questline. This faction exists without the add-on, but cannot be joined unless Knights of the Nine is installed. Unlike other official plug-ins, Knights of the Nine introduces new dialogue into NPC interactions throughout the entire game. For instance, after several of the Crusader's Relics are claimed, NPCs will mention them in rumors and in conversations with other NPCs. Similarly, by completing the questline, NPCs will sometimes refer to you as a Holy Knight or Divine Crusader. If your infamy rises above 0 after completing the questline, NPCs will sometimes greet you saying: "I used to think you were a hero. A holy knight and all that. I guess I should have known better." or "I used to admire you. But it turns out you're just a sinner like all the rest of us." Esta página foi modificada pela última vez à(s) 16h53min de 14 de fevereiro de 2018.